Wheeler Peak, NM (13,161'), New Mexico's highest point. At 13,161 feet, Wheeler Peak is New Mexicos's highest point. I have hiked Wheeler Peak many times in all seasons. 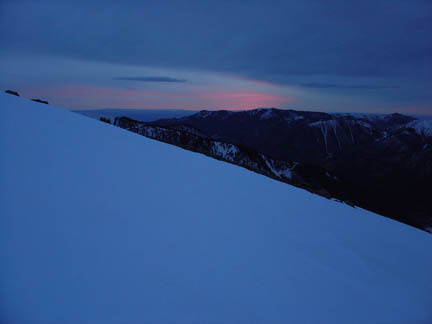 It was Earth Day 2005 and I had a hankering for another ascent. Given my late afternoon start, I planned to sleep on the summit. I parked at the Taos Ski Valley and ascended Wheeler Peak via the Bull of the Woods trail. Instead of dropping into La Cal Basin at Frazer Mountain, I stayed mostly on the ridge to Mount Walter. I descended the west face of Wheeler Peak to Williams Lake. ~7 miles one-way and 4200' vertical gain on the ascent to Wheeler Peak. All week I had planned to go backcountry snowboarding in the Williams Lake Basin with friend Mark Schraad on Saturday. But I also wanted to hike Wheeler Peak as it had been a long time since I had been up there. I decided to leave work a couple hours early and do an evening ascent. Figuring I'd get there late in the night, I decided to sleep on the summit. I had packed up what I need for a night out and for backcountry riding the night before, made arrangements to meet Mark at Williams Lake at 8:30am Saturday morning and drove to Taos Ski Valley to start the hike. I left the parking area for Bull of the Woods trail at 4:45pm. The trail was mostly dry for the first quarter mile and then turned to solid snow. I was skeptical to start skinning at that moment figuring it the trail would again turn to dirt so I kept the boards on my back. 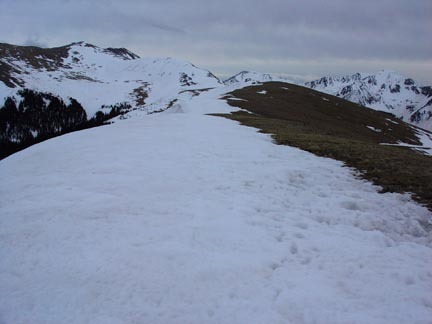 At 10,700' I started skinning up only to encounter a dry spot at about 60 yards up the trail. A short hike and I was back skinning at 10,800'. I reached the Bull of the Woods meadow around 5:45pm and turned right to follow the somewhat broken trail of previous hikers, snowshoers and skiers. The snow trail stayed nice past Bull of the Woods Mountain and to Frazer Mountain. Near Frazer Mountain the was very windblown from the west so if one stayed on the east side of the ridge, you could stay on snow. Near Frazer Mountain looking at the ridge to Wheeler Peak. Wheeler is the mountain furthest away in the left portion of the photo. At Frazer Mountain I opted to stay on the ridge instead of dropping down into La Cal Basin and skied down the south side of Frazer until I ran out of snow. I was forced to hike a bit on rock and dirt but was able to resume skinning again after about 100 yards. As I continued to skinning along the ridge I paused to watch the last bit of sunlight glow pink in the clouds to the west. Cloudy but still a beautiful sunset. By this time it was nearly 8pm and getting dark. The moonlight I had counted on was heavily filtered by the high-level clouds but still provided enough light to hike by. I reached the northern slopes of Point 13,045 and opted to skip going over the top and skirted the point on its west side. I shouldered the boards and pulled out the headlamp here as I was hiking across fairly steep scree. It went well and I was soon at the low point between Point 13,045 and Mount Walter, 13,133'. The moon was no longer obscured by clouds so I took a time-exposure shot of Mount Walter and Wheeler Peak before continuing. Mount Walter and Wheeler Peak in the moonlight with the lights of Espanola in the background. Viewing Wheeler Peak, the surrounding peaks and even the lights of the nearby towns, I was elated to be in that special place at the moment. I took a long break to photograph the surroundings and enjoy the night. Hiking by moonlight is one thing I really enjoy doing as the landscape brings on a new look under the whitish glow of the moon. 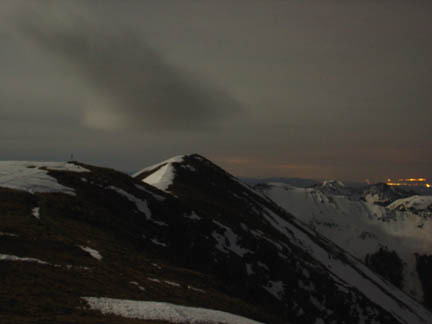 But it was getting late and I was hungry and looking forward to getting settled in on the summit. I hiked over the top of Mount Walter, New Mexico's second highest point, around 9:15pm and reached the summit of Wheeler Peak at 9:30pm. At that time the wind was blowing from the south so I found a nice rock-sheltered area that blocked the southerly wind and unfurled my bivy sack, pad and sleeping bag and crawled in. I boiled some water for tea and a dehydrated dinner, ate and drank and laid down to sleep. Soon thereafter, however, the wind picked up significantly and changed directions at the same time--now blowing from the west. Great. But my rock shelter was decent at keeping the wind from the west off me as well. Still, it was a night of not super great sleep due to wind noise but I did manage to sleep here and there. At 6:10am, I awoke to a wonderful sunrise. 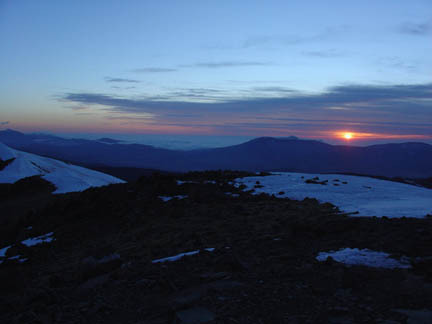 Sunrise from the summit of Wheeler Peak. It was still quite windy though and by this time I was tired of the wind noise. I picked up my sleeping stuff and moved to a slightly more wind-protected area right next to the giant summit marker. I tried to sleep a bit more but was ready to drop off the summit and out of the wind. Packing up my stuff and assembling my snowboard took about 30 minutes. I droppped from the summit down the west slope through scree and talus until reaching the snowfield about 200 feet below the summit. Here I strapped on my snowboard and prepared for "survival snowboarding" as the snow was still icy and hard. 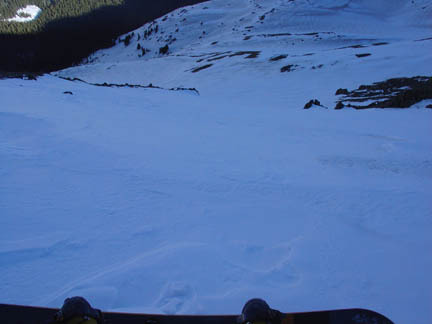 Looking down the snow field on my snowboard descent of the west side of Wheeler Peak. The riding wasn't the greatest but it beat hiking down and I arrived right at 8:30am at Williams Lake to meet up with Mark. From there we hiked up Lake Fork Peak, 12,881', a couple times for some enjoyable spring skiing/snowboarding before riding back out to our cars. Written by Jason Halladay on 24 April 2005.